SAN DIEGO — Boaters with vessels moored in San Diego Bay’s Shelter Island Yacht Basin will want to check out the Port of San Diego’s expo on eco-friendly hull paints coming April 21, as attendees will learn how to get grant funding to help make the switch to environmentally safe hull coatings. Starting at 9 a.m., the Eco-friendly Hull Paint Expo will be held at Nielsen Beaumont Premier Yachtworks, 2420 Shelter Island Drive, and ends at noon. The goal of the event is to provide the San Diego Bay boating community with information on eco-friendly hull paints that protect a boat’s hull while reducing the paint’s environmental impact. Since 1996, Shelter Island Yacht Basin has been under scrutiny from San Diego’s Regional Water Quality Control Board, which found high levels of dissolved copper in Shelter Island Yacht Basin. A high percentage of the copper was determined to have come from the leaching associated with copper-based antifouling bottom paints. As a result, the board developed a regulatory order that requires the port, marinas, yacht clubs, hull cleaners and boaters to reduce copper pollution in the Shelter Island Yacht Basin by up to 76 percent by 2022. The most environmentally friendly options are non-biocide hull paints that do not release any chemicals into the water. But the application process of the non-biocide hull paints can be costly and time intensive, which has kept many boaters from making the transition. Also, many boaters are still wary about how well the new paints will hold up in the marine environment, and they are concerned about keeping their hull protected from fouling organisms. The port was awarded a $600,000 grant from the State Water Resources Control Board in 2010, providing a cost offset for boaters in Shelter Island Yacht Basin to have copper hull paint removed from their boats. Boat owners can receive the cost offset if they repaint with a non-biocide hull paint and keep their boats in Shelter Island Yacht Basin for three years. 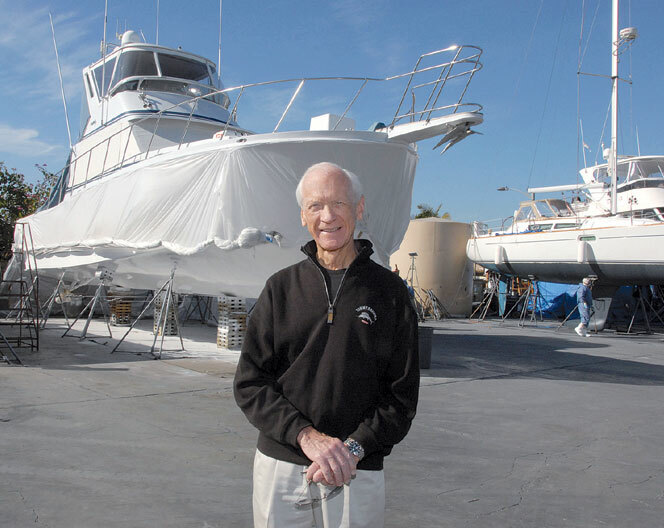 In March, Carl Smith — the first participant of the grant program — had his 42-foot powerboat Seatrek IV repainted at Shelter Island Boatyard with a non-biocide paint. “I appreciate the port’s efforts through the state grant to defray the cost of repainting the hull,” said Smith, a San Diego dentist and an avid fisherman. The program provides $6.30 per square foot to help offset the costs of stripping copper hull paint from participating boats, if owners agree to repaint with a non-biocide hull paint. These funds will be available through June 2014, unless the grant funds are exhausted before the deadline. Smith said using a nonbiocide paint “is well worthwhile to maintain a clean bay and the future health of its flora and fauna.” Smith received a pamphlet in the mail from the Port of San Diego about the grant program, studied the hull paint alternatives, and filled out the Boat Owner Interest Form. “The qualification process took about 60 seconds and was virtually painless,” Smith said. “The Port of San Diego is working with Port tenants in efforts to reduce the amount of copper in the marina basin and improve the water quality of San Diego Bay,” said Port Commissioner Scott Peters. The Port of San Diego’s April 21 expo will focus on the other benefits of eco-friendly hull paints, such as improved performance, lower fuel costs and greater longevity for the hull coatings, as reported by paint manufacturers. The expo will provide boat owners an opportunity to ask questions and get information on eco-friendly hull paints from multiple manufacturers and boatyards at a single event. The event will feature informational booths from companies of eco-friendly hull paints, local boatyards, and the University of California Coastal Resources Program. Representatives from paint companies will be available to talk about their products, and local boatyards will also be present to discuss their services and eco-friendly hull paints. San Diego Bay boatyards participating in this cost offset program are Driscoll Boat Works, Knight & Carver, Koehler Kraft, Marine Group Boat Works, Nielsen Beaumont and Shelter Island Boatyard. Staff members from the Port of San Diego will be on hand to talk about the grant program that helps Shelter Island Yacht Basin boaters convert to eco-friendly hull paints. Interested boat owners will have a chance to speak with port representatives, who will explain the program’s details and help them sign up. The event will also include free food and raffle prizes, including gift certificates from four Shelter Island hotels, Marine Exchange and Bali Hai restaurant, and a pair of Kaenon sunglasses. For more information on the event, visit sandiegobaycopperreduction.org.